When initially creating my Australian Bucket List, I hadn’t included Royal National Park on it — mostly because I hadn’t heard of it and didn’t stumble across it in my research. I only heard about it once in Sydney, and as you will see from the pictures, it is well worth the visit! From the beaches to the jaw dropping cliffs, Royal National Park definitely needs a spot on your bucket list. 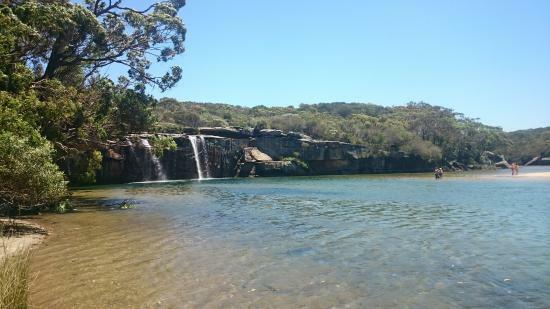 Royal National Park is only about an hour drive outside of Sydney, an easy car ride. Driving down there was actually my first time driving on the left side of the road — go big or go home right? 😉 Its actually surprisingly intuitive driving on other side, and you pick it up very quickly. It also didn’t hurt that I was totally rocking the top down convertible. After arriving at the park, we first stopped at this lake and picnic area. The rock formations reflecting upon the water were amazing — 2 semesters of required geology class actually became relevant haha! We continued on through the park and decided to stop in Bundeena and do the Royal Coastal Walk at Jibbon Beach. We grabbed some lunch in Bundeena for a picnic, and then headed off to find Wedding Cake Rock! At first look, the GPS made it seem like it was 40 min away via car… we had the top down, so no big deal, it’d be a nice drive. Wrongo. It was a 20 minute drive and then over an hour hike out to Marley Head Overlook. We had already walked a good amount that day, and I realllyyyy wasn’t feeling a 2 hour roundtrip hike to see a rock. But, Katie was really excited to go so I sucked it up. And boy am I glad I did. The views were absolutely incredible. The cliffs overlooking the Pacific Ocean, honestly left me at a loss of words. During our lunch, Katie looked out and spotted whales spraying off in the distance! There were quite a few of them spraying and playing right out in front of us, it was incredible. We also looked down and saw a seal playing in the surf right below the cliffs. After eating, we walked a bit down the trail more and finally came across Wedding Cake Rock — only to realize you’re no longer able to go out on it 🙁 There are signs all around saying it could fall at any moment and not to risk your life for a picture. Normally I’d probably have still gone out on it, but they literally cemented a fence around to block it off clearly if they went to all that effort, its pretty serious. Regardless, it was still beautiful to see! It’s so beautiful 😍 Definitely one for the list. Shame on me I never been to Australia yet..